Another Ben 10 adventure comes your way with this great game Ben 10 Alien Device! It is a story based game with multiple mini-games and puzzles as Ben defeats Kevin and Vilglax to save Grandpa and Gwen. There are multiple missions, locations and you get to play with different aliens on occasions too! Ben 10 Alien Device begins as Grandpa Max receives a message that Kevin has escaped from the Null Void. He calls for Ben and Gwen to go to the Plumber Base and get the null void projector. On the other hand, Vilgax has got the hold on the powerful Alien device that can destroy any electrical machine including the Omnitrix. Ben 10 goes through different locations, collects different objects that help him solve various puzzles as he finds his way to the Plumber base and gets the Null Void Projector. And finally, with the help of that defeats Kevin and Vilgax to rescue Grandpa and Gwen. Recommended for You: Play Ben 10 Running Games Online Now for Free! First of all, you have to play this game only with the mouse and no keys. Guide Ben to reach different spots on the screen. Hover the mouse on different objects, humans, and even animals to know what to do next. Ben 10 Alien device game is such a game that takes mental ability to play. You need to decide which object could be used at with mini-game. In fact, to change into the alien, you have to play a mini Omnitrix game. There are five locations in the game through which Ben travels to ultimately reach Vilgax. These are City, Mount Rushmore, Airfield, Dessert and Military Base. Pro Tip: Make all moves correct in the Omnitrix mini-game to earn extra points. There are other accessories also to help Ben to complete different missions. You can use X-Ray binoculars to scan through the scene. 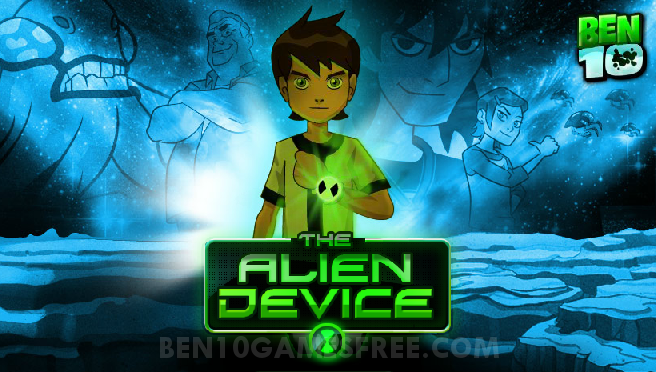 Read about all the accessories available in the Ben 10 Alien Device game carefully below. X-Ray Goggles: You can use the x-ray goggles to see all the things you interact with. Backpack: You can use the backpack for viewing areas you have discovered. Help: If You are not sure how to continue the adventure, you can click Help to get some hints or advice. Secret Area: Discover the secret areas of each chapter for additional benefits. Gems: Collects the gems to earn extra benefits. So, all about Ben 10 Alien Device game. Now it’s your turn to get started. Remember Grandpa Max and Gwen’s life is at stake and Vilgax has the powerful Alien device. Use all your mind and gaming skills to make Ben find the Alien Device and kill Vilgax! Good Luck!! Don’t Forget to give your rating for Ben 10 Alien Device game and share your tips and tricks to win this game in the comments section below.